UFC lightweight champion Khabib Nurmagomedov might want to fight boxing legend Floyd Mayweather, but UFC president Dana White doesn't want to hear about it. White told ESPN on Friday that the rumors of such a bout should be ignored, seemingly chalking it up to Mayweather's tendency toward self-promotion. "Don't pay attention to it," White said. "First of all, the Mayweather team has not approached us at all. 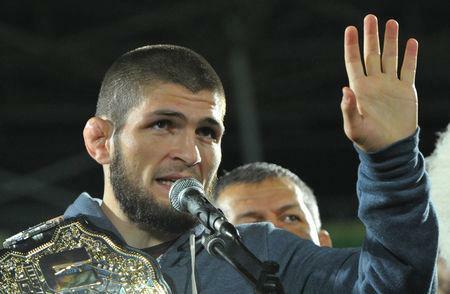 Khabib is under contract with the UFC. Floyd is very good about getting his name out there when he wants to." Nurmagomedov is coming off a submission victory over UFC star Conor McGregor that was tainted by a post-fight brawl both inside and out of the octagon. McGregor famously lost to Mayweather in a boxing match before returning to the UFC. Last weekend, Nurmagomedov was alongside Mayweather Promotions CEO Leonard Ellerbe when he announced in a video posted on social media, "Let's go Floyd, we have to fight now. 50-0 vs. 27-0, two guys who never lose. Let's go, why not? Because in the jungle, there's only one king. Of course I'm the king because (Mayweather) cannot drop McGregor, but I drop him easily. Let's go." Mayweather responded Monday on Twitter: "CBS, Showtime and MGM Grand get the checkbook out! Go to @leonardellerbe's page to view Khabib Nurmagomedov challenging me." Nurmagomedov then replied to Mayweather on Instagram: "@floydmayweather But no Vegas, they won't pay my money." That was a reference to Nurmagomedov's $2 million purse from his UFC 229 win over McGregor being withheld while the Nevada Athletic Commission investigates a postmatch brawl. After Nurmagomedov (27-0) defeated McGregor via fourth-round submission, the 30-year-old Russian went into the crowd to fight members of McGregor's team. McGregor has actively campaigned for a rematch against Nurmagomedov, but White is in no hurry. "I haven't even thought about a rematch," White told ESPN. "Obviously, I know Conor wants a rematch. We need to do what's right and what's fair. We'll see how it plays out. We literally haven't thought about it yet."